The quality of starting materials dramatically influences the properties of the final cellular product. Therefore the ultimate success of your cell product depends on the quality of the raw materials used. For the development of cell-based and gene therapy products regulatory authorities may require the use of strict procedures according to GMP regulations. 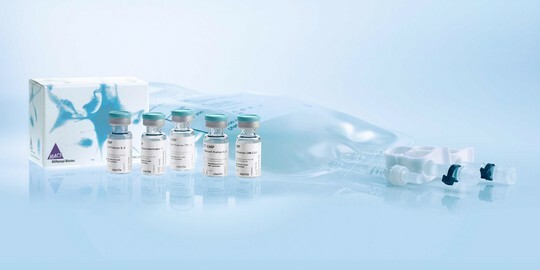 The quality of raw or ancillary materials used for the manufacture of these products such as fluorescent antibodies, antigens, cell culture bags, cell culture media and cytokines need to meet regulatory specifications in order to ensure quality, safety, and efficacy of the final cell product. Soluble antibodies, antibody-coated cell-sized particles (ExpAct Treg Kit), and nano-sized polymeric matrix (T Cell TransAct™) for clinical-grade activation and expansion of cells. Peptide Pools and antigen lysates for the efficient stimulation of antigen-specific T cells and the pulsing of antigen presenting cells for dendritic cell vaccination research. Excellent cell growth and differentiation under serum-free conditions according to GMP guidelines. GMP Fluorescent Antibodies for cell labeling and flow sorting of cell populations from heterogeneous human blood products. culture processing in clinical research.